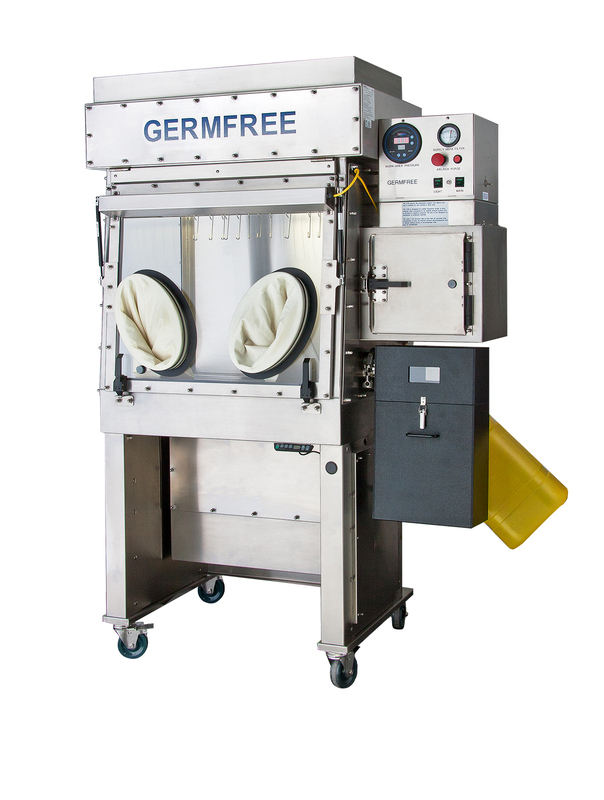 Germfree’s Compounding Aseptic Containment Isolators use HEPA (High Efficiency Particulate Air) filters to provide the highest level of operator and product protection. The supply HEPA filter provides laminar flow air, which bathes the entire work area. The exhaust HEPA filter handles all air exiting the LFGI. Additionally, two HEPA filters located inside the HEPA Purge Airlock filter the purged air. All filters are rated to remove particulates and aerosols 0.3 micron in size with a minimum efficiency of 99.99%. Particles that are smaller or larger than 0.3 micron are filtered at a greater efficiency. 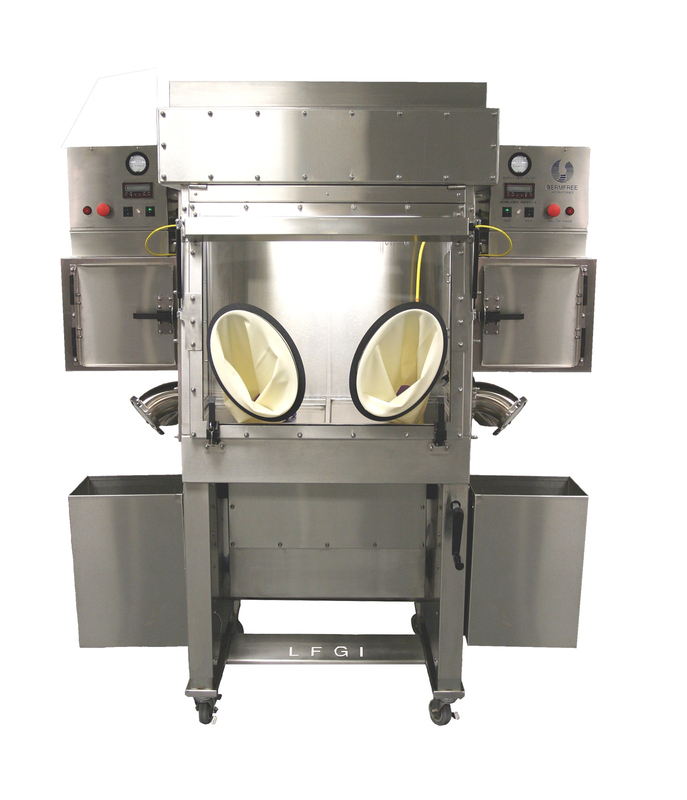 The LFGI Compounding Aseptic Containment Isolator provides personnel and product protection from particulates, dust, powders and aerosols. Microbiological particulates and aerosols, with the possible exception of prions, are also removed. Operator and product protection from gas and fumes are NOT provided by HEPA filtration, but limited protection from gas and fumes can be provided by venting or ducting. In accordance with the NIOSH alert on the handling of hazardous drugs, the LFGI can be configured for no recirculation and total exhaust of all air exiting the work area. 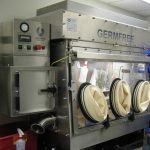 Germfree’s Compounding Aseptic Containment Isolators are designed to meet all USP 797 guidelines for sterile compounding, as well as the regulations for handling hazardous drugs according to USP Chapter 800. 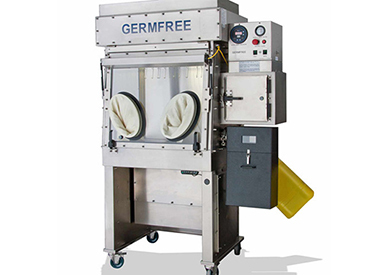 Germfree’s Compounding Aseptic Containment Isolators are ergonomically designed. 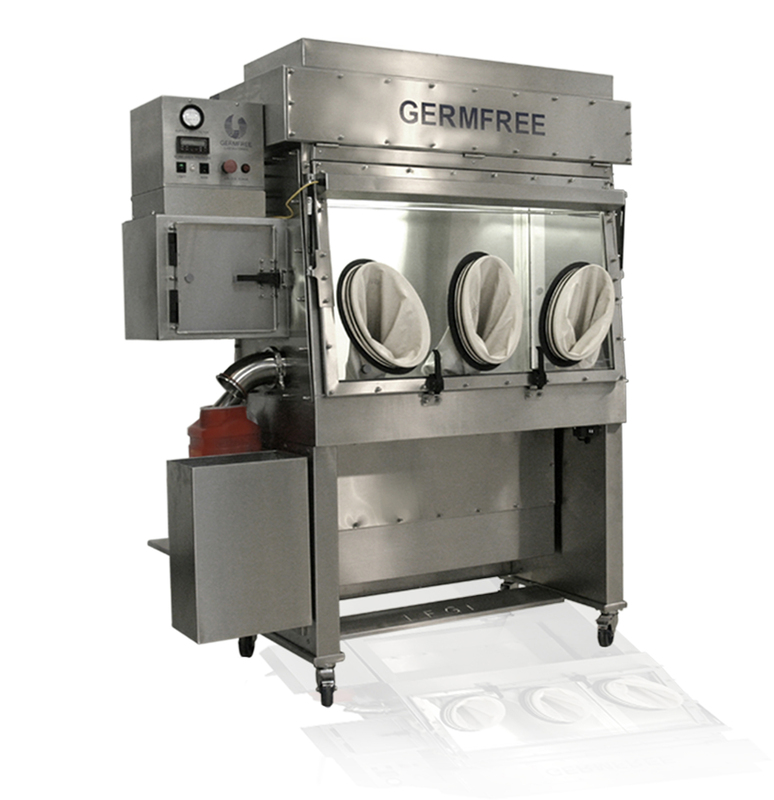 Germfree’s Compounding Aseptic Containment Isolators are constructed of high quality all welded stainless steel with a pharmaceutical grade finish. The unit incorporates an integrated height-adjustable stand with locking cleanroom grade casters. The ergonomic, stainless steel sliding tray inside the airlock is designed to eliminate reaching strains. 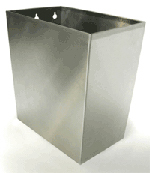 Further, the stainless steel interior work area trays are removable and are designed to slide over one another. This facilitates easy cleanup under the work dec k. The extra large oval gloveports incorporate a two-part sleeve/glove system that allows for use of most types and sizes of commercially available gloves. Glove changes can be made while maintaining containment, to enhance personnel protection. 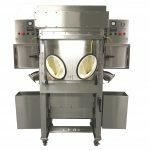 The fluorescent light housing of the Compounding Aseptic Containment Isolator is externally mounted to provide optimum lighting in the work area. The Acrylic viewing panel is encased in a stainless steel frame and set at an angle to reduce glare and enhance operator comfort. 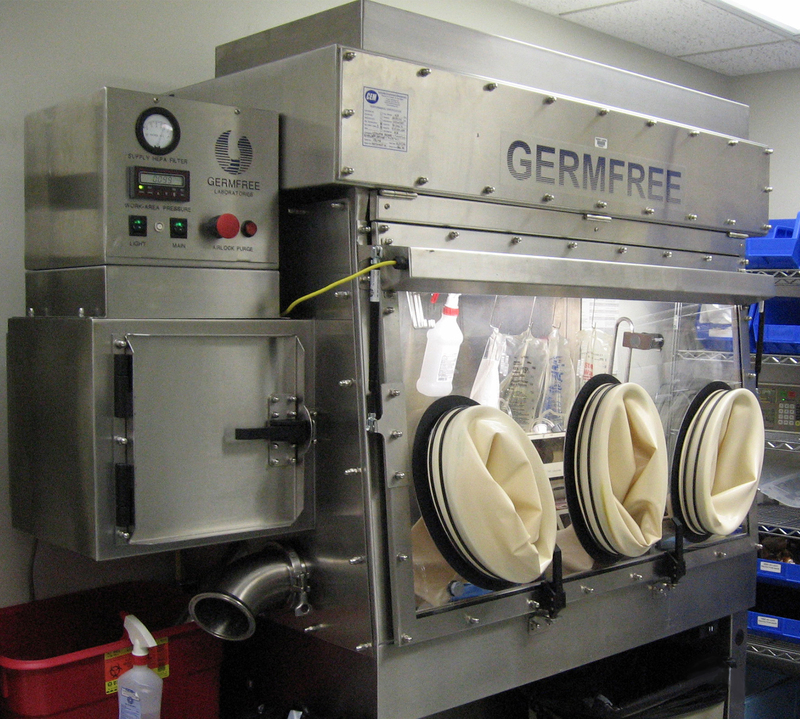 The LFGI’s system for waste and sharps removal has seals to maintain work area containment. A fully adjustable shelf is included to accommodate most commercially available wide-mouth or hinged-top sharps collectors. The LFGI Series of Barrier Isolators meet or exceed ISO 14644-1 for Class 5 air quality. 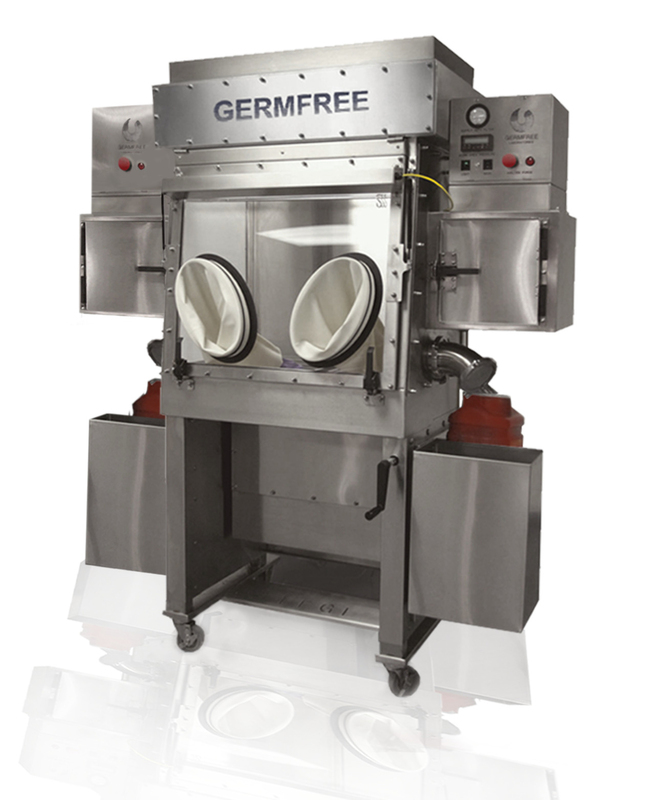 Each Germfree Compounding Aseptic Containment Isolator undergoes rigorous physical testing before shipping to assure the unit meets all performance requirements. It is required that independent certification be performed before use of LFGI – Laminar Flow Glovebox/Isolator. 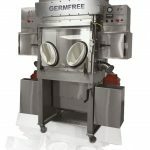 Germfree’s LFGI Series of Compounding Aseptic Containment Isolators provide an advanced solution for compliance of USP 797 sterile compounding requirements as well as USP Chapter 800 standards for handling hazardous drugs. 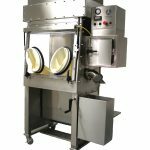 Sealed two-door airlock (16″ wide x 13 ½” deep x 14 ¼” high) maintains complete environmental separation between work area and ambient conditions. 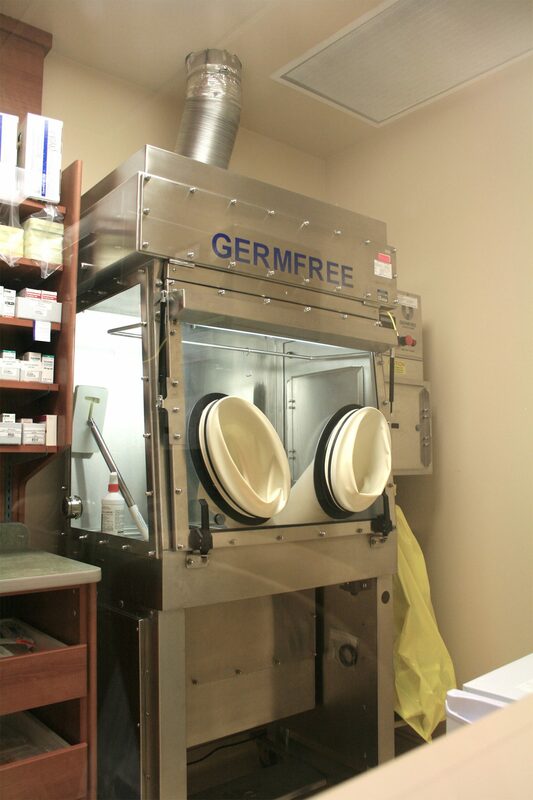 HEPA-filtered Purge System: Cross contamination between the unit’s work area and the room is eliminated by purging the airlock with HEPA-filtered air. This is critical for material ingress and egress. Sharps Tube: Straight 2 ½” diameter tube to facilitate quick drop of the largest syringes. Provided with an easily removable seal/stopper to maintain work area containment. Lock-out handle requiring key for access to work area. Digital pressure readout with low pressure alarm for work area. Inward/Outward Face Velocity is 95-100 linear feet per minute at gloveport opening to protect operator and product in the event of a breach of containment. Glove changes can be made without breaking containment. Locking casters are standard. Seismic anchors are available. 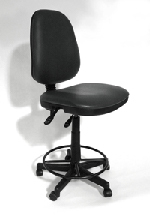 Hydraulic-assist, height-adjusting stand offers a full 10″ range variance allowing operators to sit or stand comfortably for extended time periods. Stainless steel sliding tray inside the airlock pulls into the work area, eliminating reaching strains. Two part sleeve/glove system allows the use of most types and sizes of commercially available gloves for better dexterity and tactility. Extra large oval gloveports are placed at an ergonomically correct angle to accommodate a wide range of body types and increase range of movement. 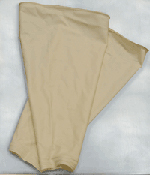 Gloveports have a 3″ arm rest to facilitate operator comfort and reduce fatigue. Large viewing panel is set at an angle to minimize glare and enhance operator comfort. Positive or Negative Pressure Operation: The unit’s overall work area pressure can be either positive or negative and may also be adjusted by a certifier when the unit is in place. Antechamber can be set for left or right-handed operators or can be installed for use on both sides. 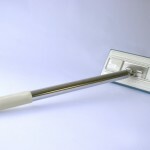 Waste and sharps removal tubes can be set for left or right-handed operators or can be installed for use on both sides. Three available exhaust options can be factory-set or changed by a certifier when the unit is in-place. Full framed, standard-size Minipleat HEPA Filters: 100% of inlet and exhaust air is filtered from both the work area and the antechamber to provide a fully contained environment. HEPA filters are full coverage and front-loading for easy replacement by a certifier. Pre-filter extends life of work area supply HEPA filter. Can be replaced without tools. High capacity motor/blower system with speed control to extend life of HEPA filters. Ten foot hospital grade power cord with molded grounded plug. Sealed outlet in work area. Separate, lighted, power ON/OFF indicator switches for blower and lighting. High efficiency, standard sized fluorescent lights are externally mounted to minimize heat build-up. 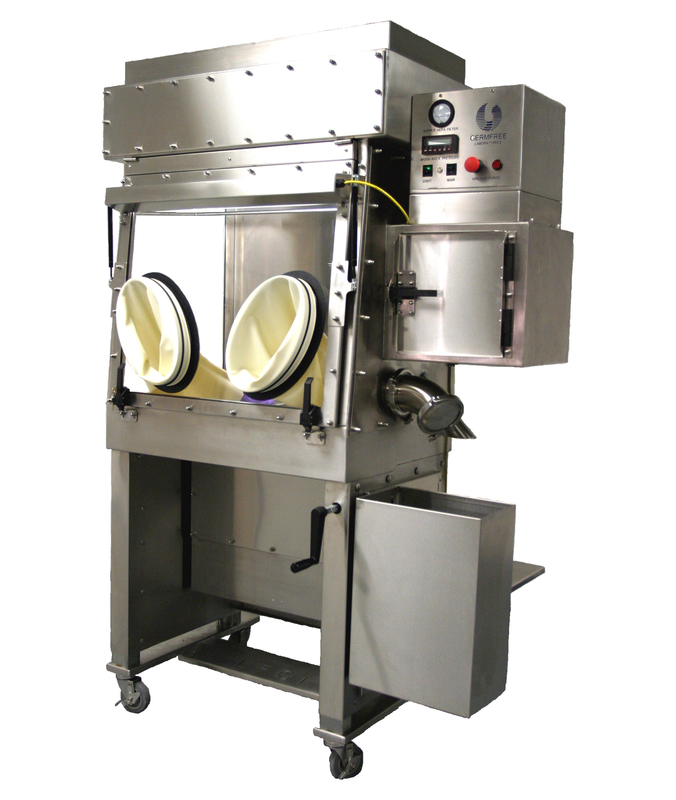 Clean air plenum is external to the work area of the Compounding Aseptic Containment Isolator. Constructed to allow for optional outside venting of exhaust air. Constructed to allow for 3 exhaust options that can be factory set, or changed by a certifier in place. Venting is not required for operation but is optional. GRx Rapid Exchange Glove System with full case. USP 797 provided the first official and enforceable requirements for preparing CSPs -Compound Sterile Preparations. USP 797 is the U.S. Pharmacopeia’s (USP) General Chapter ‘797 for Pharmaceutical Compounding Sterile Preparations’. According to the organization these requirements set “practice standards to help ensure that compounded sterile preparations are of high quality”. Chapter fundamentally changed the way that facilities that prepare compounded sterile preparations approach their work. Chapter 797 applies to all facilities that prepare CSPs. This includes hospital and health-system pharmacies that prepare compounded sterile preparations including main hospital pharmacy operations and satellite pharmacy units. USP 797 also applies to clinics, hospital care units as well as other facilities that handle the compounding of sterile preparations. 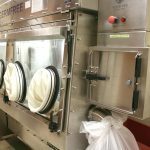 As facilities change their procedures to meet USP 797 and, they are finding that barrier isolators can provide an ideal alternative to a more costly cleanroom. 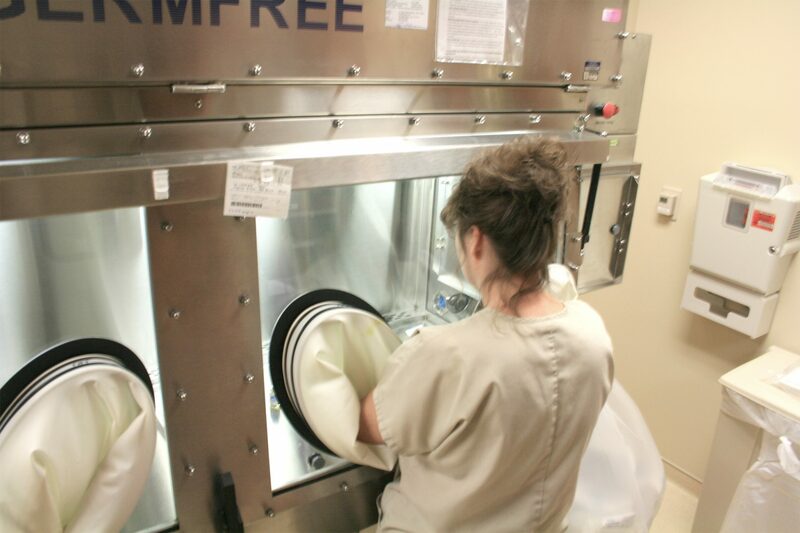 The Food and Drug Administration states that a barrier isolator is: “a decontaminated unit supplied with HEPA filtered air that provides uncompromised continuous isolation of its interior from the external environment, including surrounding cleanroom air and personnel.” Installing a Compounding Aseptic Containment Isolator provides cleanroom conditions within a contained workspace. 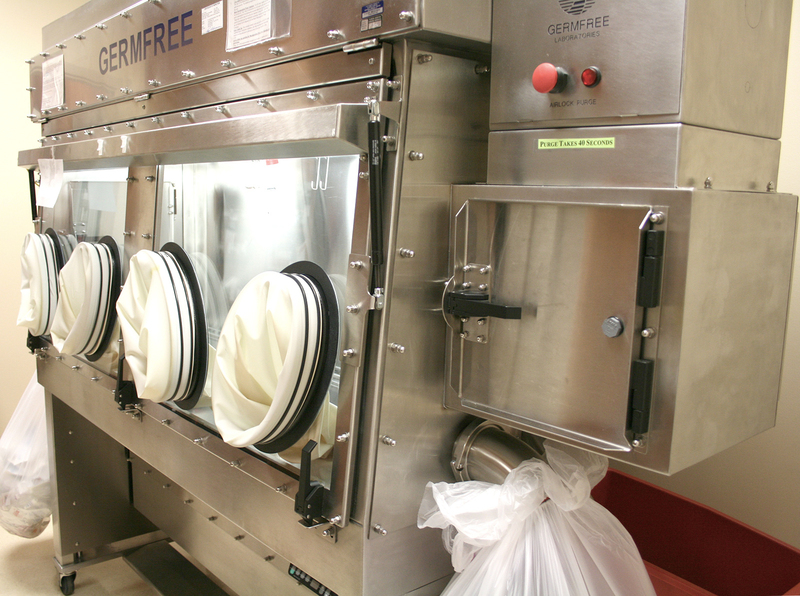 Compounding Aseptic Containment Isolators provide an ISO Class 5 (Class 100) environment for product preparation, with work occurring inside a closed, pressurized work space, accessible only via a sealed gloves system. 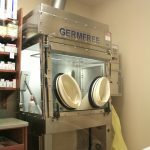 Germfree’s Compounding Aseptic Containment Isolators are an ideal solution for providing a clean work environment in the pharmacy industry when compounding sterile preparations. As there no true uniform industry standards for manufacturing isolators, there are significant design differences among manufacturers. 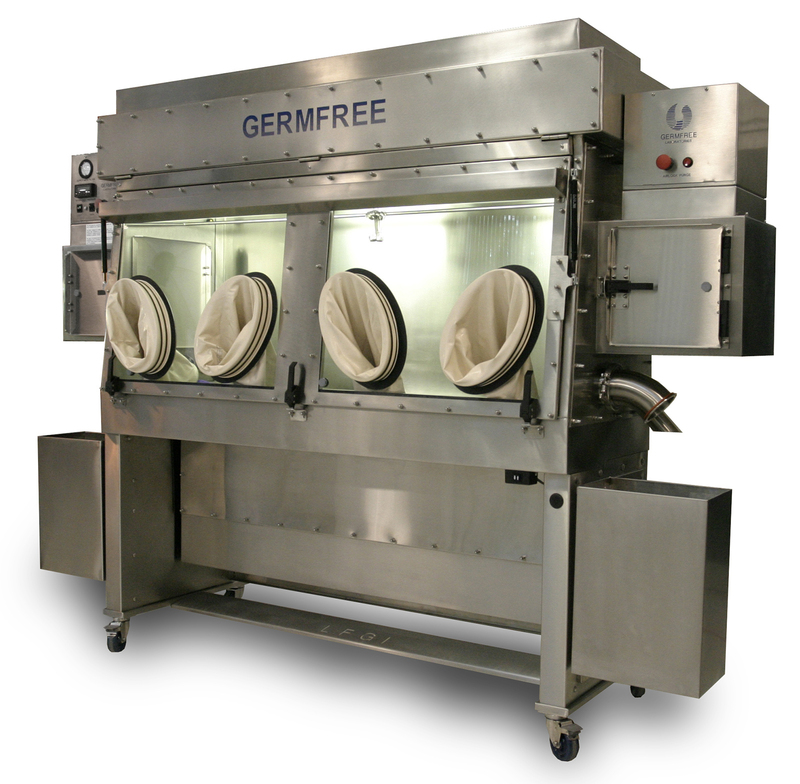 A well-designed isolator that will significantly reduce microbial contamination should meet a range of minimal standards. 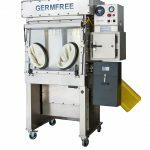 Germfree is a GSA Schedule contractor. GSA customers please click here. 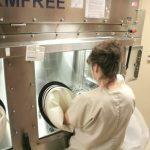 Read more about Germfree's unique Rapid Exchange Glove System (GRx) and our Total Customer Care Plan.